Where do I start when beginning a new mix? I’ve seen lots of posts addressing this question over the years, some better than others. For someone just starting this may be the most intimidating step in the recording process. When I was an apprentice working on all analog gear I was taught that things were done a certain way and in a certain order. In an analog environment, this makes sense. In the digital realm however, you have a daunting amount of choices. This is probably why I keep getting asked how I begin a mix; especially a mix with a bunch of tracks. So I’ll walk you through how I like to mix a song. First of all, whether I’m working with 6 tracks or 60, my approach is the same. 60 tracks takes more time and more organization, but the methodology is identical. The first thing I do after I have all of the tracks loaded in to my DAW is to organize them in to busses. I route all the percussion together, all the guitars together and so on. This may seem like an obvious starting point, but you may be surprised how many people I’ve seen skip this quick and simple step. I mentioned organization earlier. This is where it begins. The next thing I do is a rough mix with the raw tracks. The only things I adjust at this point are the faders and the panning. What I’m trying to do is create a picture of what the soundscape would look (sound) like if the band were playing live right in front of me. This is where I fall back on my live mixing experience. For me, this step is crucial. This is where I begin to get to know the song. This is where I begin to form my ideas of how I want to approach the mix. Once I have this idea in my head, I write it down. Taking notes about what I want to emphasize and what I don’t is essential to my process and it helps to keep me on track during the mixdown. Now that I have my rough mix and my notes I switch the master fader to mono. One of my favorite bloggers when it comes to recording advice, Graham Cochrane, runs a website called The Recording Revolution that I’ve mentioned in earlier posts. One of the things he constantly harps on is the merit of mixing in mono. And he’s exactly right. He has several posts that address mono mixing and they’re all worth reading. I will be writing my own opinions and experiences with this method in the near future, but for now, lets just say it works. When I start making tweaks to individual instruments, I always start with the drums and I always treat the kit as one instrument. After I’ve checked the polarity on the drum tracks, I solo the entire drum bus and start tweaking individual drum channels while listening to the whole kit. Close drum mics (as opposed to overheads or room mics) are supposed to capture one particular drum and ignore the others. However, in the real world this is rarely the case. You can make this happen pretty consistently in a well built drum booth with very high quality, expensive drum mics. Unfortunately, I don’t have either. 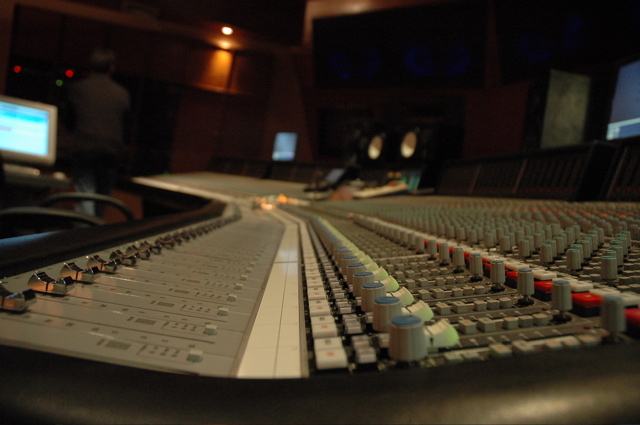 In fact, K14 Studios specializes in live recording. We record artists in clubs, venues and even practice spaces; none of which are ideal recording environments. The vast majority of drum tracks that I mix are full of bleed over from other drums. Instead of gating everything down so tight that it starts to sound like midi drums or triggers, I simply treat the whole drum kit like any other instrument with multiple mics on it. This method also has the side effect of creating a very live and natural sounding rhythm track. As far as tweaks in general, I love using a channel strip emulator for this step. The SSL E channel emulator by Waves is my go to. It gives me my pre-amp control, EQ, filtering, gating and compression all in one plugin. Besides the convenience factor, it just sounds great to my ear. After the drums I move on to the bass, then guitars, then whatever else, and finish up with the vocals. I make any needed adjustments to track volumes at this point. I always work in this order. When I think about how I want a song to sound when its finished it typically turns out pretty rhythm heavy. Working in this order helps me achieve that. Only when I’m happy with the mix do I add any effects. So far I haven’t mentioned any of the plugins that I might use or where I use them. I’ll get into some of those in other posts, but the truth is, in most cases I only use delay and reverb. I own a ton of cool plugins, but I’ve narrowed the list of the ones I actually use down to just a handful. Previous Post How do I know when my song is finished? How long should mixdown take? Next Post What is Phase Correlation? Should I be concerned?